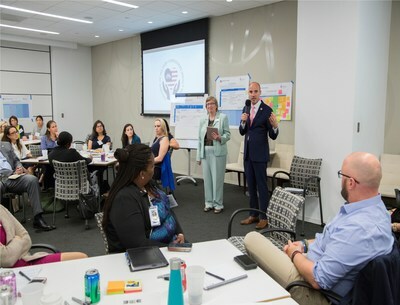 WASHINGTON, Feb. 11, 2019 /PRNewswire/ -- Wounded Warrior Project® (WWP) announced a new collaborative partnership with the Elizabeth Dole Foundation (EDF) and the National Military Family Association (NMFA) to support efforts to help caregivers of wounded veterans and their children. WWP's collaboration with EDF (https://www.elizabethdolefoundation.org) and NMFA (https://www.militaryfamily.org) is in response to the finding that no research has been conducted to examine the effects of caregiving on military children. Enable EDF to host a follow-up to their 2018 WWP-supported Impact Forum in Washington, DC, which brought together more than 50 caregivers and leaders from across the veterans space to spark a conversation regarding the effects of caregiving on military children and the need for research on this population. An academic study on the impact of caregiving on the children of wounded, injured, or ill veterans. Qualitative research conducted on military caregiver children's challenges and unmet needs, as well as resource gaps, by leveraging the EDF Caregiver Fellows network and NMFA's Operation Purple Healing Adventures. Disseminating research findings at a follow-up EDF & NMFA forum and across digital platforms. "When we think of supporting servicemembers returning home, we often forget about the hidden heroes: America's caregivers," said René Bardorf, WWP senior vice president of government and community relations. "Due to the efforts of EDF and NMFA, we now more fully understand that veterans' children often have additional stress placed on them due to their parent's injuries. Through this joint venture, we hope to better understand these impacts and how best to help them cope." "Our partners at Wounded Warrior Project have generated an unparalleled level of awareness and support for those wounded in action. Our country's appreciation for our wounded warriors would not be what it is today without their incredible work," said Steve Schwab, chief executive officer of the Elizabeth Dole Foundation. "Wounded Warrior Project recognized early on the importance of the Elizabeth Dole Foundation's mission to serve the caregivers of wounded, ill, and injured servicemembers and veterans. They have been loyal partners from the very beginning and, together, we continue to make tremendous strides in strengthening the support offered to America's hidden heroes." "The youngest hidden heroes have gone unnoticed far too long," said NMFA Executive Director Joyce Wessel Raezer. "Caregiver kids are forced to grow up quickly, taking on roles and responsibilities at home that take away from the fun and carefree nature of childhood. It's an honor to work with committed organizations, like Wounded Warrior Project and Elizabeth Dole Foundation, to create a path forward that makes these young heroes a priority." Since 2012, WWP has partnered with over 120 organizations involved in the care of America's military community by providing more than $74 million in grants. To learn more about how WWP partnerships with organizations like EDF and NMFA are improving the lives of millions of warriors and their families, visit https://wwp.news/Newsroom.